Across all age brackets, well over 170 students entered the twelfth annual “Richard Eberhart Poetry Contest,” hosted in Mower County by Austin Public Schools. That high turnout is proof positive that the contest’s namesake, Austin’s literary native son, is as beloved there today as ever. 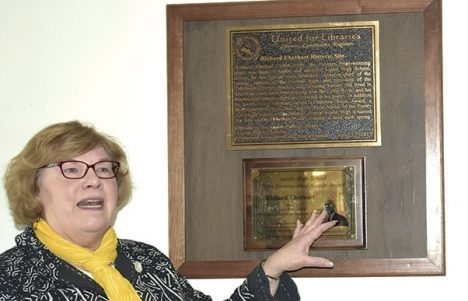 On April 17, in conjunction with that popular annual event, MALF and the Friends of the Austin Public Library dedicated Austin High School (AHS) as Minnesota’s seventh Literary Landmark. AHS ensconced the special dedicatory plaque in a place of honor, alongside a Distinguished Alumni Award granted to the renowned poet in 2004. Richard Eberhart is both a Pulitzer Prize and a National Book Award-winning author. Furthermore, much of his lauded poetry is inspired by the highlights and travails of his Austin childhood. (Indeed, he even named one of his dozen books Burr Oaks, after his family’s childhood estate just outside of town!) In short, then, Eberhart was an obvious candidate for receiving the American Library Association co-sponsored “Literary Landmark” honor. Locating the commemoratory plaque, however, took some thought, given that so many sites in town – such as the Library and Burr Oaks estate – boast a legitimate claim. Austin High School ultimately won the laurel, notes Sue Grove (president of the Friends of the Austin Public Library and a member of MALF’s programming subcommittee for Literary Landmarks), because the alumnus stood out as an emerging superstar even during his school years. Here, faculty nurtured Eberhart’s young talent, and primed him for his future successes. Things came full circle on April 17 when, after the dedication ceremony at AHS, attendees walked across the street to the Hormel Historic Home to see the final round of the 2017 Richard Eberhart Poetry contest. Twenty-four finalists – three from each of the district’s eight schools – read original works aloud.